In "March's Advanced Organic Chemistry" I have read about the general mechanism of the acetal hydrolysis. It names the acid-catalyzed SN1 or SN2 as a possible mechanism for a Acetal-hydrolysis. Now I am interested to know if SN1 or SN2 is mainly going on at the Hydrolysis of Sucrose to Glucose and Fructose. So I compared the different parameters which influence SN1/SN2. Polarity of the solvent: Water -> really polar -> SN1 preferred. Mesomeric stabilization There is also a mesomeric stabilization between the resulting carbocation and a Oxonium-Ion in the SN1-Mechanism. Steric Hindrance: In my opinion, through the planar region around the anomeric C (planar ether), there is no steric hindrance -> SN2 possible. Temperature: high temperature -> SN1 preferred. So to conclude: Many different aspects. Because of the main points "steric hindrance" and the destabilized primary carbocation intermediate I would conclude that the hydrolysis of Sucrose goes mainly (maybe a little bit over SN1) over SN2. Have I forgotten something important? Are my assumptions "No steric hindrance" and primary carbocation-intermediate correct? I have attached my possible SN1-mechanism. The mechanism supplied in the question statement is wrong according to this paper, where the evidence favored Carbon-Oxygen bond cleavage on the fructosyl-side instead of the glucosyl-side of the bridge Oxygen. 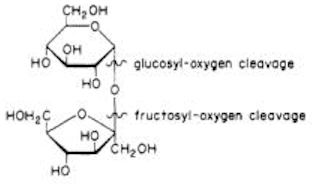 As that reference states, "the initial products of the hydrolysis are a-D-glucose and a fructosyl carboxonium ion"
But don't feel bad, many textbooks have shown the same mechanism (detailed in the Discussion section of the paper). It's possible that the reaction mechanism changes with conditions, but I know of no evidence for that. 1) The question statement refers to "primary" carbocations twice, and so do three of the comments. But in this reaction the 2 alternatives are a secondary or tertiary carboxoniun ion (for this terminology see Olah (1998) Onium Ions or ref 11 of the above paper). 2) It makes sense that an SN1-type mechanism would take place on the fructosyl-side of the bridge Oxygen since the resulting carboxoniun is tertiary rather than secondary. Now, the real question is: How would you experimentally determine the mechanism? That is where the science comes in. The fact that so many textbook authors have presented this classic reaction with different mechanisms should be a big lesson to all students. That expert authors would go to the extent of drawing detailed reaction mechanisms in a textbook that are not backed up by experimental reality, shows how mistrustful we should be of any non-experiment-based opinions. And this is for a classic, textbook example. How much more unreliable "expert opinions" are for much more complicated things! Not the answer you're looking for? Browse other questions tagged organic-chemistry reaction-mechanism stereoelectronics or ask your own question. What is the mechanism of saccharification by H2SO4? What conditions would make SN1 products the major products over E1 products, and vice versa? Why is HCl used in hydrolysis of sucrose?